Requirements: Minimum 4 people, minimum 5 days for this Land Based Fishing Safari. We also offer our Mothership Fishing Charters, in this area too with Guided and Tag- a-Long Options, this requires min 8 people, 5 days. Please call Scott 0438 026 873, for prices. Price: POA. Includes Darwin to Arnhem Land Camp return flights. Option of scenic flight, subject to flight costs and availability. Humbug Fishing hold a section 19 from Northern Land Council enabling us to take you to many remote fishing regions of the NT within Arnhem Land at the base of the Cobourg Peninsula. This is the charter you are looking for if you want to experience, awesome fishing and outback lifestyle with tropical tent style accommodation in swags. 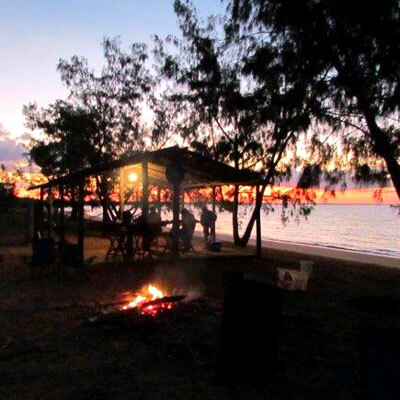 Fish during the day from our tender boats and fossick for mudcrabs amongst the mangroves, experience the fun of driving 4wd quad motorbikes, enjoy the idyllic beaches and looking for bush tucker, relaxing in the water tank pool on the shore line as the sun sets, ready for feed. We offer fly in fly out option for this charter, leaving from Darwin Airport to the Indigenous community of Murganella (airstrip), on arrival Scott will meet you on landing and you’ll be driven by bush track to our remote fishing camp on the coast in our1970 Bush Limo Landcruiser! Operating during the period of August til Late November depending on the wet season arrival. This camp caters ideally for 8 guests, enabling 4 guests per tender boat. We have a min of 4 people, with a minimum of 5-day stay. A large open-air, dining/bar area for meals, most meals are cooked over hot coals including fresh fish, catch of the day, bush tucker and of course for the meat eaters, 1 inch thick steaks! Meals include, Breakfast before leaving, lunch on the boats, after fishing nibbles whilst you wait for Scott and the crew to prepare dinner. Accommodation is Darwin Troppo tents, with 1 person per tent, each tent supplied with a swag and a fan. 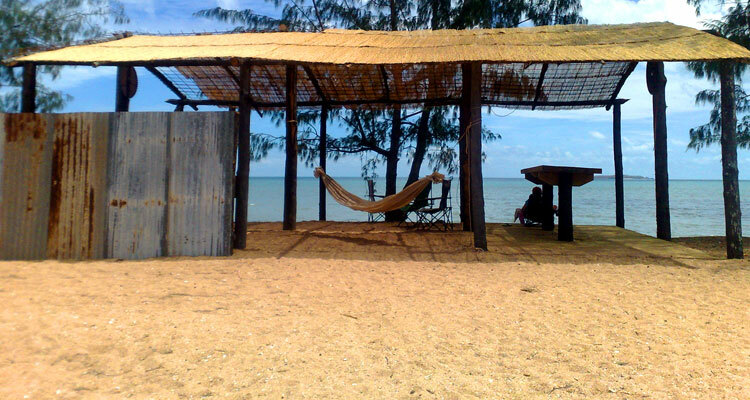 The authentic bush long drop for a toilet and 2 comfortable showers all with a sea view. Then a relax to soak up the experience or if your still not tied, try a bit of night fishing from the shore. Flights from Darwin to Murganella airstrip return, 20min road trip to coastal camp. All meals, cooked breakfast, lunch on the tenders, nibbles in the late afternoon and catch or the day, or steak, chops and fresh produce for dinner. Dietary requirements can be catered for just let us know.